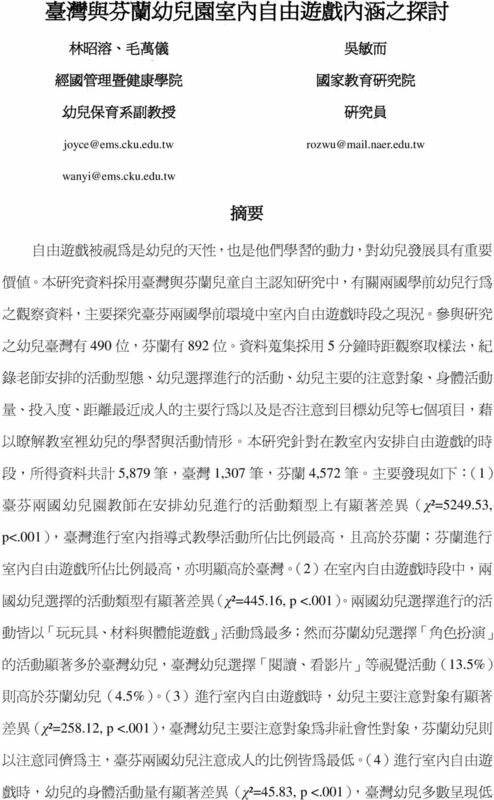 Download "度 身 體 活 動 量 ; 芬 蘭 幼 兒 呈 現 中 度 身 體 活 動 量 之 比 例 高 於 臺 灣 幼 兒 (5) 幼 兒 在 投 入 度 方 面 亦 達 顯 著 差 異 (χ²=185.35, p <.001), 芬 蘭 與 臺 灣 幼 兒 多 半 表 現 出 中 度 投 入 與 高 度 "
4 also presents significant differences (χ² = , p <.001) between two countries. In both countries children are mostly play with "toys, materials and physical game" during indoor free play time; however Finland children select "role play" are significantly more than children in Taiwan. 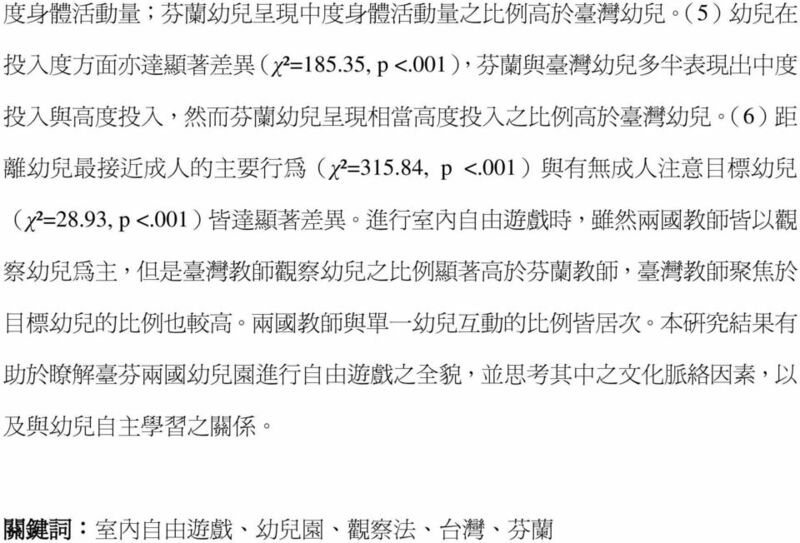 Taiwan children choose reading, watching videos "visual activities is much higher than Finnish children. 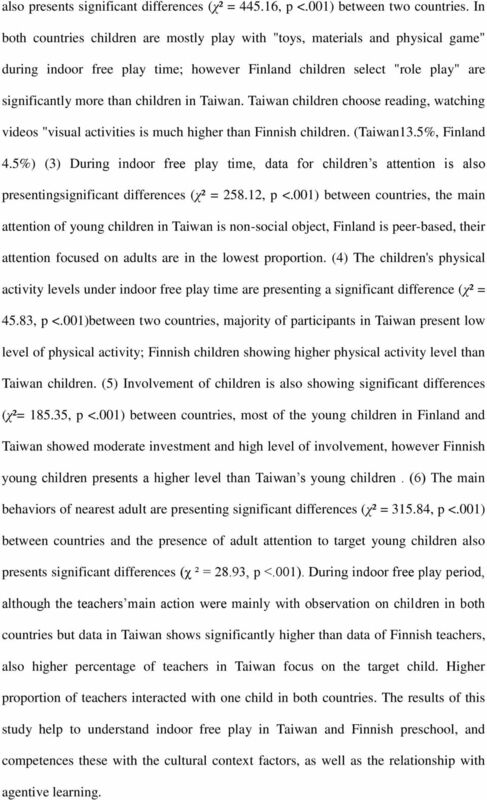 (Taiwan13.5%, Finland 4.5%) (3) During indoor free play time, data for children s attention is also presentingsignificant differences (χ² = , p <.001) between countries, the main attention of young children in Taiwan is non-social object, Finland is peer-based, their attention focused on adults are in the lowest proportion. (4) The children's physical activity levels under indoor free play time are presenting a significant difference (χ² = 45.83, p <.001)between two countries, majority of participants in Taiwan present low level of physical activity; Finnish children showing higher physical activity level than Taiwan children. (5) Involvement of children is also showing significant differences (χ²= , p <.001) between countries, most of the young children in Finland and Taiwan showed moderate investment and high level of involvement, however Finnish young children presents a higher level than Taiwan s young children. (6) The main behaviors of nearest adult are presenting significant differences (χ² = , p <.001) between countries and the presence of adult attention to target young children also presents significant differences (χ ² = 28.93, p <.001). During indoor free play period, although the teachers main action were mainly with observation on children in both countries but data in Taiwan shows significantly higher than data of Finnish teachers, also higher percentage of teachers in Taiwan focus on the target child. Higher proportion of teachers interacted with one child in both countries. 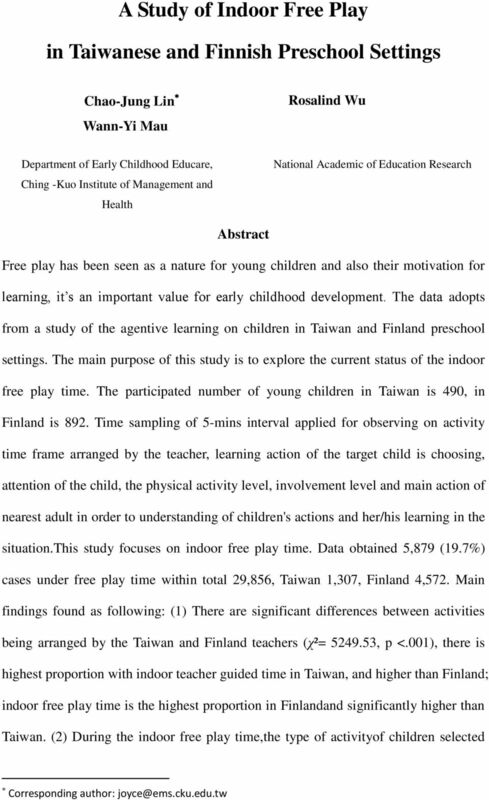 The results of this study help to understand indoor free play in Taiwan and Finnish preschool, and competences these with the cultural context factors, as well as the relationship with agentive learning.